Connections of "NAKED" cameras are limited to the minimum necessary. 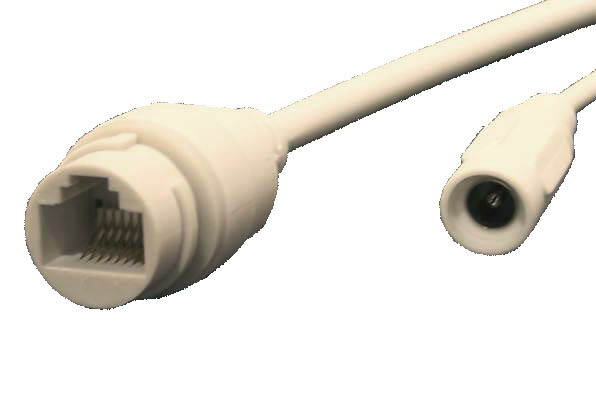 On the left, the RJ45 network plug, on the right, the 12VDC plug. A few models also support POE. Thanks to the Onvif protocol, there is no need of extra wiring for camera PTZ control like for analog speed dome. Easy connection by Internet Explorer allows live view and camera configuration. Download our VMS 256 channels NVR software, suitable for all DSE IP cameras. "Naked" IP cameras are designed to connect to NVR like our DN range. They are also suitable to NVR or IP software of other vendors which support the onvif standard. Our PTZ cameras are a new concept of CCTV camera. Similar to fixed cameras in shape and mounting, these camera feature Pan Tilt Zoom remote control, like speed dome cameras. PTZ cameras are the best choice if you look for a motorized camera at a slightley higher price than a ordinary fixed camera. "Naked IP camera". What does it mean? 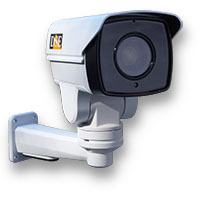 DSE Naked IP cameras are developed to provide the maximum quality/price ratio for IP CCTV systems controlled by NVR. All hardware and software resources of these cameras are just focused to send a high quality video streaming to the NVR. Unlike our RH range IP cameras, which come with a full pack of built-in features, most of these cameras have a basic hardware setup in order to provide high quality video at a lower price. Nowadays, NVR are very popular because they make IP CCTV systems more powerful and easier to install. They are also user friendly and inexpensive products. NVR users do not require a lot of features and options to come with the camera, because they mainly use the NVR to control their system. If this is your case, this range of NAKED camera is the best choice for you, providing the highest video quality at the minimum price. IP cameras connect to an IP network that can be made on purpose or already existent. They include an Ethernet port that can be plugged straight to the switch. NVR, connected to the same network, are used for video recording. Pan Tilt Zoom up to 12° sec. These cameras come with a built-in motor which moves the camera on horizontal (PAN) and vertical (TILT) axis. All operations can be controlled remotly by means of PC or NVR. Unlike speed dome cameras, these PTZ cameras can be wall mounted like normal fixed cameras and support 250° pan and 55° tilt rotation. Rotation speed is automatically adjusted according to the zoom level up to a maximum of 12°/sec PAN speed and 10°/sec TILT speed. These cameras come with 10x (5-51 mm.) or 4X zoom lens according to the version. Cameras feature a precise autofocus system (can be switch to manual if required) in order to adjust the focus automatically according to the target distance. Pant/tilt dome speed can be set to change automatically according to the zoom level. This range of IP cameras provide 2MP (Full HD 1080P 1920x1080 pixel) or 4MP (2560x1440) video resolution, according to version. 2MP resolution is today most popular high definition TV standard and is ideal for most CCTV systems. 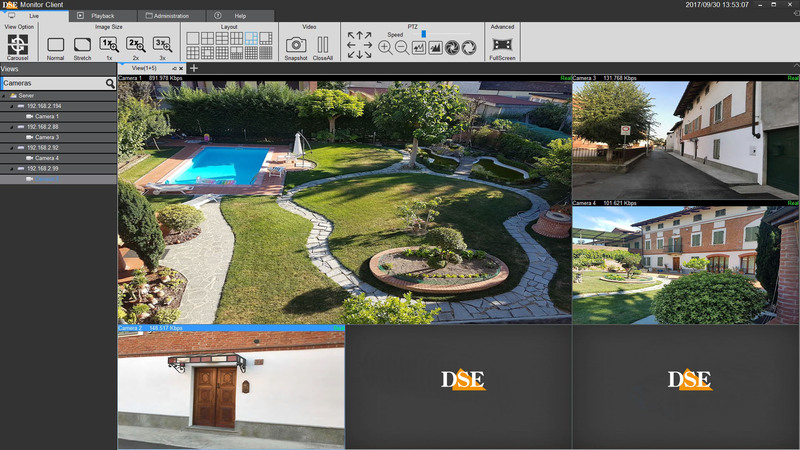 4 MP resolution gives more details when zooming in, therefore is recommended for large areas or whenever the maximum perception of tiny details is required. This range of IP cameras come with the latest video compression codec H264 and H265 in order to provide high quality video streaming with minimum bandwidth required. These cameras produce 3 different video streaming, each with different compression and video resolution, to be chosen according to the client device. The frame rate is also selectable up to real-time 30 frame/second. The market of IP cameras is divided in quality segments, much more than analogue cameras. For this reason we need to point out that even if the RK range is much cheaper than our RH range, this does not mean these are lower quality products. The lower price has been achieved by just removing all those options and features which are not strictly necessary when an NVR is used to control the camera. We did not save money on camera hardware. On the contrary, we selected the state of the art technology in order to provide the maximum video quality and product reliability. In the PC industry as well as in the TV field, 16:9 video format is the digital standard of most modern LCD WIDE SCREEN monitors. Whether you have a 1080P or 4K monitor, our 2MP (1920x1080) and 4 MP (2560x1440) cameras are going to suit its native resolution avoiding quality loss due to picture resizing. All 2MP cameras in this range support PoE standards (IEEE 802.3af Class 3). If your LAN switch support PoE technology, these cameras can be powered through the LAN cable without the need of extra power adaptors. Alternatively, all these cameras can be powered by a 12VDC adaptor (not included). 4MP cameras do not support POE, but only 12VDC power. Cameras come with 4 maxi IR LED's at 850 nm. which allows a maximum illumination range of 50/80 m. according to model. The IR illuminator switch on automatically at night at allows the camera to monitor even in darkness. All cameras include the day & night feature so they provide color video during the day and B/W view at night. The IR illumination power, as well as the activation threshold, can be adjusted by user. The day & night feature is made by Infrared Cut-Filter Removable (ICR) which provides better low light sensitivity and superior color rendering than other cheaper technologies. Video files can be recorded on the base of a built-in programmable scheduler. Recording video within the camera is very useful if you do not want to use a PC or a NVR for videorecording or if you want to keep a security backup of your videos. Cameras can manage recycle recording by overwriting older files once the storage capacity is exhausted. To playback recorded videos you do not need to remove the card. Video footage can be searched and played over the network using an Internet browser. These cameras can store predefined positions, generally called PRESET, each of them identified by specific XY coordinates, zoom level and focus adjustment. Preset can be called by remote just entering the Preset number. It is also possible to configure automatic TOUR (also called CRUISE or PATROL) among several preset. Cameras can store up to 256 PRESET and up to 8 TOURS. Both preset and tours can be recalled at anytime. 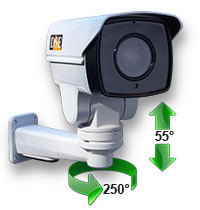 PTZ cameras can monitor large areas by turning continuously at 360° in order to provide a panoramic view. These cameras store up to 8 scan functions, each one with different left/right limits. 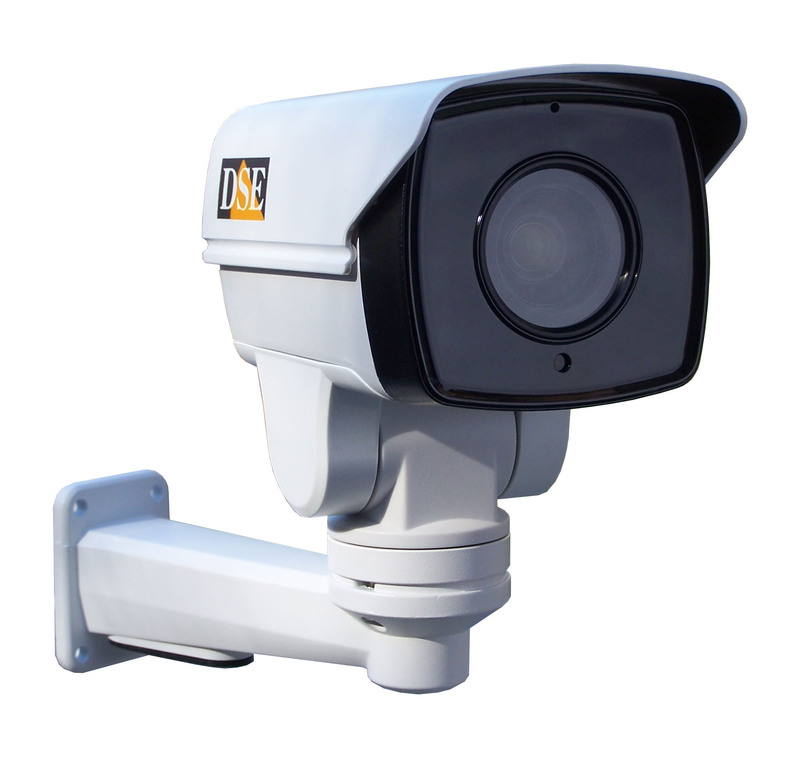 DSE PTZ cameras can record any custom-made sequence that can be re-called at any time and be executed automatically. This function is generally known like PATTERN recording. These cameras can store up to 4 customized patterns. In case of alarm, the cameras can send pictures and videos by e-mail of to FTP server. Cameras can send email messages in case of of blinding attempts. Sensitive areas can be masked in order to prevent privacy violation for example in work places or public areas. These cameras control up to 4 privacy masks that moves automatically according to the camera rotation. These cameras come with an IP66 waterproof casing that can be installed outdoor and is not effected by corrosion, even in salty environment. The wall mounting bracket is included in the package. These PTZ cameras are not suitable for ceiling mount. To view your cameras over the network or the Internet you do not need anything else than a computer and Internet Explorer web browser. 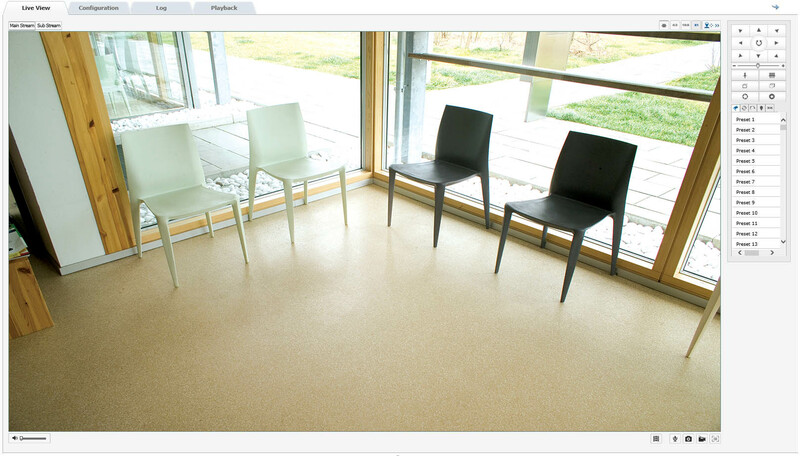 Through the web interface user get access to live view, PTZ control and camera settings. The IP setting software tool, provided free of charge with every camera, is useful to search all PTZ cameras within the network in a matter of seconds. With a few click of your mouse you can set the network options of the camera and make it visible to other computer. Using ONVIF standards, the RJ range cameras can be connected to any ONFIV compliant IP recording software or stand-alone NVR (Network Video Recorder). Should you need an NVR, please see our DN range. All cameras installed outdoor, expecially those where cables run undergroud or on poles, can be demaged by atmospherical overvoltage. These cameras include surge suppressors which protect the units against this kind of spikes up to 3KV.